RaceTrac Breakfast Grab-and-Go for the Whole Family – Everyone Wins! Summer break is officially over which means back to school and back to the chaos of rushed mornings and Baton Rouge traffic! For those busy mornings when you need a grab and go option for breakfast, we might have you covered! Our family made a stop at our local RaceTrac to try out their new limited RaceTrac breakfast sandwich made with Kellogg’s Eggo Waffles, in all stores now through November 7. The Eggo breakfast sandwich includes maple syrup, sausage, egg and cheese all stacked together between two classic Eggo Waffles. We have four growing boys and they love/need a hearty breakfast; they wanted to try this new breakfast sandwich that sounded questionable but kinda yummy. They loved it, honestly, we all enjoyed our grab-and-go breakfasts, there was something for everyone. My husband tried the chicken buttermilk biscuit made with Tyson chicken breasts, he gave it two thumbs up, sandwiches are made in-house with hand-selected, high-quality ingredients and assembled fresh in-store every day. My favorite, the ham, egg and cheese croissant as well as the sausage, egg and cheese biscuit, among others, are all cooked throughout the morning and made available in the hot case for a FRESH, easy grab-and-go breakfast all morning long. My husband is a bit of a coffee snob so I knew the coffee would be the deciding factor on whether our RaceTrac breakfast would be a success… the Guatemalan coffee was on point! Don’t take our word for it though, try it! RaceTrac’s “Crazy Good Coffee” bar offers a variety of blends of fresh brewed coffee, including 100 percent Hazelnut, Regular, Columbian, Guatemalan, Decaf and Dark Roast. RaceTrac’s coffee bar also features cappuccinos, iced coffee, hot teas and hot chocolate. RaceTrac is stepping the coffee game up in 2018 with new coffee machines that will allow guests to be their own barista by selecting their favorite coffee blend and watching the beans grind right before their eyes into the freshest cup of joe. What the what?!?! Have you been in a RaceTrac lately? They’re serving up more than just breakfast; if you’re looking for a healthy refuel, RaceTrac’s sandwiches are made in-house with hand-selected, high-quality ingredients every day too. Cut fruit and salads are made and delivered fresh to the stores daily as well. And guests still have a 1-in-3 chance to win more of their favorites like pizza, hot dogs, ice cream, coffee and $1 fountain drinks in any size with their Wintastic Summer Rewards program. RaceTrac is offering families fantastic rewards this summer with their Wintastic Summer Rewards program. There’s a 1-in-3 chance to WIN every time you make a qualifying purchase with the RaceTrac app, now through Labor Day. We have partnered with RaceTrac for their Wintastic Rewards campaign. As part of this Program, I received compensation for my time. RaceTrac believes that consumers and influencers are free to form their own opinions and share them in their own words. These policies align with WOMMA Ethics Code, Federal Trade Commission (FTC) guidelines, and social media engagement recommendations. There is nothing like a home cooked breakfast on summer mornings with the kiddos. These little delights are something in between a crepe and a pancake and are super easy to make. The perfect no guilt breakfast that feels like an indulgence. However, these pancakes are full of protein and gluten free! You have to try this recipe to believe it. This recipe only calls for two ingredients, eggs and a banana. However, they taste even better with cinnamon and vanilla, throw some berries on top of these and you have healthy perfection on a plate! Feel free to add butter and syrup or honey but these pancakes are super moist and sweet just as they are. Mash banana with a fork. Mix mashed banana with egg, cinnamon and vanilla extract. In a pan, on medium-low heat coat pan with coconut oil, extra-virgin olive oil or spray and add about ¼ cup of the banana egg mixture. Let the pancake set for about 30-45 seconds. Flip when bottom side is set. Nothing says comfort food like warm, homemade muffins. These Dark Chocolate Berry Muffins are flavorful, full of antioxidants and all around goodness. Homemade muffins make a quick breakfast or easy snack, but there isn’t always time in the morning to whip up a batch. You can prepare this recipe ahead of time and keep in an airtight container for a quick breakfast before school or even on the go. They keep great in the refrigerator, heat in the microwave for 7 seconds and they’re like fresh out of the oven again. They can even be frozen and mocrowaved for 30 seconds. To freeze, let them cool completely and individually wrap each muffin with plastic wrap then place in airtight freezer bag. Soak the oats in milk for one hour. Preheat the oven to 375 degrees and spray a muffin pan with cooking spray or use liners. In a medium bowl, whisk together flour, baking powder, salt and mini chocolate chips. Set aside. In a large bowl, using an electric mixer, beat butter, sugar and vanilla for 2 minutes until light and fluffy. Add eggs, one at a time, beating after each. On low speed, add flour mixture, mixing just until combined. Do not overmix. Add the wet ingredients to the dry mix until just combined. Fold in berries. Do not over-mix. Spoon the mixture into the muffin pan. Bake for 20-25 minutes, or until toothpick comes out clean. Makes 12 to 15 muffins. Five Favorite Holiday Breakfast Recipes – Quiche, Frittata, Casseroles and more! You don’t have to be a gourmet chef to judge how appetizing and flavorful these 5 breakfast meals are. The Quiche Lorraine with Spinach is one dish which will never fail to impress your guests. We eat this every holiday morning and it heats well a day, or two or even three days after making. My boys will devour two whole pies of this family favorite in minutes! I usually double or triple this recipe and make four quiche at a time. This is also the perfect quick breakfast to make ahead for busy mornings when the family is rushing to get out the door. Ready to go into the oven… not the prettiest crust but it will do. -Preheat oven to 425. 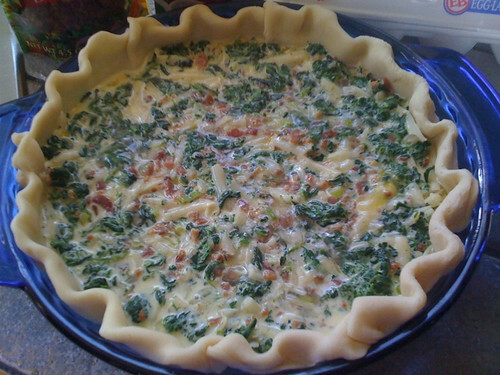 -In pie shell, combine bacon, spinach, cheese and onion. -Separately, mix together eggs and milk, add salt and pepper. Pour into pie shell. -Place quiche on baking sheet and put in the oven. Bake 15 minutes at 425, then reduce heat to 350 and bake 30 minutes more. It’s done when a knife inserted comes out clean. This recipe can be made with a number of different ingredients, including leeks, shallots, capicolla ham, sausage, mushrooms, asparagus, red peppers, tomatoes and mushrooms. Preheat oven to 425. Heat oil in 10 inch ovenproof nonstick skillet. Add ham and zucchini, season with salt and pepper. Cook 5 minutes. Add eggs and gruyere, season with salt and pepper. Cook until edges are set, 2 minutes. Transfer to oven, cook 10-13 minutes. Cut into 6 wedges. Also try: Potato-Leek Frittata, Spinach, Onion, and Bacon Frittata, and Tomato, Scallion, and Cheddar Frittata. In a greased 11-in. x 7-in. baking dish, combine the bread cubes and cheese. In a large bowl, whisk the eggs, milk, salt and pepper; pour over bread and cheese. Sprinkle with bacon. Bake, uncovered, at 350° for 50-55 minutes or until a knife inserted near the center comes out clean. Let stand 10 minutes before serving. Make the Dough: In a small saucepan, warm the milk over moderately low heat until it's 95 degrees F. Pour the warm milk into the bowl of a standing electric mixer fitted with the dough hook and stir in the sugar and yeast. Let stand until the yeast is foamy, about 5 minutes. Add the softened butter, eggs, grated lemon zest, and sea salt. Add the flour and beat at medium speed until a soft dough forms, about 3 minutes. Increase the speed to medium-high and beat until the dough is soft and supple, about 10 minutes longer. Scrape the dough out onto a lightly floured surface and knead it with your hands 2 or 3 times. Form the dough into a ball and transfer it to a lightly buttered bowl. Cover the dough with plastic wrap and let stand in a warm place until doubled in bulk, 1 to 2 hours. Line the bottom of a 9- by 13-inch baking pan with parchment paper, allowing the paper to extend up the short sides. Butter the paper and sides of the pan. Turn the dough out onto a lightly floured work surface and, using a rolling pin, roll it into a 10- by 24-inch rectangle. Make the Filling: In a medium bowl, toss the frozen raspberries with the sugar and cornstarch. Spread the raspberry filling evenly over the dough. Tightly roll up the dough to form a 24-inch-long log. Working quickly, cut the log into quarters. Cut each quarter into 4 slices and arrange them in the baking pan, cut sides up. Scrape any berries and juice from the work surface into the baking pan between the rolls. Cover the rolls and let them rise in a warm place until they are puffy and have filled the baking pan, about 2 hours. Preheat the oven to 425 degrees F. Bake the rolls for about 25 minutes, until they are golden and the berries are bubbling. Transfer the pan to a rack to cool for 30 minutes. Meanwhile, Make the Glaze: In a small bowl, whisk the confectioners' sugar with the butter and heavy cream until the glaze is thick and spreadable. Invert the rolls onto the rack and peel off the parchment paper. Invert the rolls onto a platter. Dollop glaze over each roll and spread with an offset spatula. Serve warm or at room temperature. The sweet rolls can be filled with a variety of frozen fruit. Try blackberries, strawberries, blueberries, or chopped sweet cherries. Heat oven to 375°F. Using 1 tablespoon of the butter, generously butter 12-cup fluted tube cake pan. In small microwavable bowl, microwave remaining butter on High 1 min or until melted when stirred. Separate both cans of dough into 16 rolls. Cut each roll in half crosswise; place half of roll pieces in pan. Sprinkle with half of the dry pudding mix and half of the brown sugar. Drizzle with half of the melted butter. Repeat with remaining roll pieces, pudding mix, brown sugar and melted butter. Sprinkle with chocolate chips. Bake 24 to 28 minutes or until rolls are deep golden brown and dough appears done when slightly pulled apart. Cool in pan 2 minutes. Place heatproof serving platter upside down over pan; turn platter and pan over. Remove pan. Cool 15 minutes. Remove lid from icing. Microwave icing on High 10 to 15 seconds or until of drizzling consistency. Drizzle icing over ring. Cut into wedges to serve. Prep the night before - put everything except butter in pan the night before, refrigerate. In the morning, drizzle the melted butter over the top and bake.